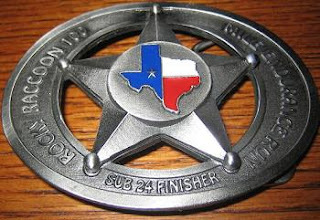 This is what I'll be running for this coming Saturday February 3rd at the Rocky Raccoon 100 Miler. Well actually I'd be running it even if they didn't give this really cool buckle. I hope to run a 100 Pr and have a realistic goal of 22:30. Of course a lot can happen in a hundred miles but I have been training well, the knee seems to be fine and I have a plan. If I stick to my plans, I am usually successful in reaching my goals. I do have a fantasy goal also that fits in the plan. A couple of people I have run with know what that is but other than them, I'll keep it a secret until after the race. It looks like good weather for running, with a temperature range of 32 to 53 for the weekend and only a 10% chance of rain. There is also almost a full moon to help light the way at night. As I've stated before, I love running by natural moonlight and I hope I can keep my flashlights off on the some parts of the course. It is a relatively flat course on jeep road and single-track trail in Huntsvile State Park. There are some sections that have a lot of exposed roots but I'm not too worried about that. I've run on many technical trails before. There are currnetly 265 runners signed up and they are still going to accept entries at the race site this weekend. Last year they had a record 196 starters so it continues to grow in popularity. You can check out the race website here for more info. They have the results from past years and one neat thing is a photo tour of the course so you can get an idea of what the trails are like. There will be no live web updates online but they should have results posted soon after the race and I will be letting a few folks know how it went.